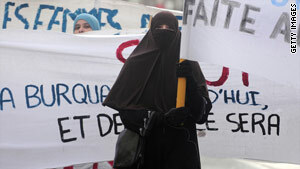 A woman in Tours, France, in February protests the movement in France to ban the full Islamic veil. (CNN) -- French lawmakers on Tuesday overwhelmingly approved a resolution that calls the full face-covering veil -- in the form of the Islamic niqab or as part of a burqa -- contrary to the values of the nation. "We cannot let [the veil] cover the face of our nation," said Jean-Francois Cope, the parliamentary majority leader, before the vote, according to French newspaper Le Monde. The nonbinding resolution, which passed 434-0 in the French National Assembly, does not make the wearing of a full veil or burqa illegal, but gives public officials support when asking people to remove it. Cope said the resolution is not a law "but a political statement in the true sense of the term," Le Monde reported. He also called it a message for those in France and around the world who "are fighting for the values of dignity, freedom, equality and fraternity," according to Le Monde. Some French lawmakers have said they believe the burqa is a growing phenomenon beneath which lies a not-so-subtle message of fundamentalism. The vote brings the country one step closer to an outright ban on the veil in public spaces, though the law hasn't been fully written and is not likely to be voted on before July. In drafting Tuesday's resolution, members of a French parliamentary commission said they wanted to assist those working with members of the public when asking that full veils be removed. That would include school teachers who meet children's parents or ticket agents at train stations. Last month, lawmakers in Belgium approved a ban on the wearing of burqas and other Islamic garb that covers a woman's face. The bill must still be approved by the upper house of Parliament before it becomes law.